1. 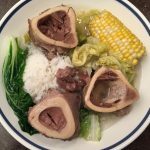 Boil bone marrow bones and beef shank in a pressure cooker for about 1-1/2 hours or less with a pressure cooker (until the meat is tender and bone marrow is no longer red) 2. Skim off the scum as it floats toward the top. Carefully take out the bones and meat with a wide strainer spoon. 3. Strain the broth for a clearer soup base. Some would discard the broth and start over with fresh water and add beef flavoring. Combine the strained broth with the bones and beef in a deep skillet and add onion, garlic, and peppercorns. 4. Bring back to a boil and skim off excess fat as it accumulates, however, leave some for the flavor. 5. Reduce heat to low. Add corn cobs and chayote. Simmer until corn is done and chayote is tender. 6. Add salt/pepper/fish sauce to taste. 7. Add the bok choy and napa cabbage last to keep it bright green but cooked enough for serving. 8. Serve over hot rice.